I once asked this question to one of the Java developers during Interview and like many other, he answered that Arrays.asList() can convert an array of primitive integer values to ArrayList<Integer> in Java, which was actually wrong. Even though, Arrays.asList() is the go-to method to convert an array to ArrayList in Java when it comes to converting a primitive array to ArrayList, this method is not useful. The Arrays.asList() method does not deal with boxing and it will just create a List<int> which is not what you want. In fact, there was no shortcut to convert an int to ArrayList<Integer> or long to ArrayList<Long> till Java 8. From JDK 8 onwards, you either hade to make a utility method or need to use general purpose Java libraries like Google Guava or Apache Commons to convert an array of primitive values like. byte, short, char, int, long, float, and double to ArrayList of Byte, Character, Short, Integer, Long, Float, and Double wrapper classes. Though from Java 8 onwards, you can use the java.util.Stream to convert an int to ArrayList<Integer>. There are specialized stream implementations for primitive data types like IntStream for primitive int, LongStream for primitive long and DoubleStream for primitive double, which can convert an array of primitive values to a stream of primitive values. Once you get the Stream of int values, you can use boxed() method to convert it to Stream of Integer wrapper objects. After that you can just convert Stream to List as shown in that article i.e. you can use collect() method of the stream with Collectors.toList() to get a List. 1) The IntStream.of(primes) is converting an int array to IntStream object. 2) The boxed() method of IntStream convert applies boxing on each element of IntStream and return a Stream of Integer i.e it converts IntStream to Stream<Integer> object. 3) The collect() method collects all elements of Stream into any Collection class by using Collectors of Java 8. A Collector encapsulates the functions used as arguments to collect(Supplier, BiConsumer, BiConsumer), allowing for reuse of collection strategies and composition of collect operations such as multiple-level grouping or partitioning. 4) The Collectors.toCollection() method collects elements of Stream into a Collection which is specified by the first parameter. Here we are passing ArrayList::new which is a constructor reference, which means all elements of Stream will be collected into an ArrayList. See The Complete Java MasterClass to learn more. By far, That was the simplest way to convert an array of primitive data types to List of wrapper objects like an array of ints to ArrayList of Integers. From the output, it's clear that both ways of converting an array of primitive values to ArrayList of objects work fine. You can use whatever you want. 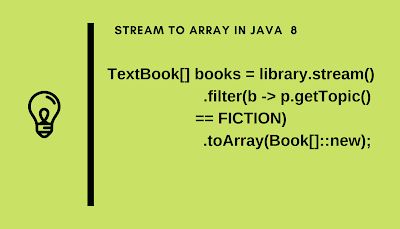 See From Collections to Streams in Java 8 Using Lambda Expressions to learn more. The code is pretty simple and self-explanatory. We are iterating over ArrayList using enhanced for loop of Java 5 and adding each int value from array to ArrayList. When you add, Java uses autoboxing to convert an int value to Integer object, so in the end, you have an ArrayList of Integer. Though, you can also use other ways to loop over array e.g. by using for or while loop. One slightly important thing to note is initializing ArrayList with the length of the array. This prevents ArrayList from being resizing multiple times. If you remember, by default ArrayList initialize with 10 elements and then keep resize when it is about to fill, I guess when the load factor grows up to 0.75 it resizes and doubles itself. This involves a lot of array copy, which can slow down your application. It's also a Java collection best practice to provide size while creating an instance of any Collection class like ArrayList. See The Definitive Guide of Java Performance for more such tips. That's all about how to convert an int to ArrayList<Integer> in Java. You can use this technique to convert any primitive array to ArrayList of respective wrapper class like you can convert a long to ArrayList<Long>, a float to ArrayList<Float>, a double to ArrayList<Double>, a char to ArrayList<Character>, a short to ArrayList<Short>, and a byte to ArrayList<Byte> in Java. In general, you should use Stream if you are using Java 8, it's cleaner than the Java 6 approach and also takes just one line to convert a primitive array to ArrayList. If you don't know much about Stream and Java 8, I suggest you read a good book on Java 8 to learn more about IntStream and other Stream features like Java 8 in Action. Thanks a lot for reading this article so far. If you like this article then please share with your friends and colleagues. If you have any question or feedback then please drop a comment.